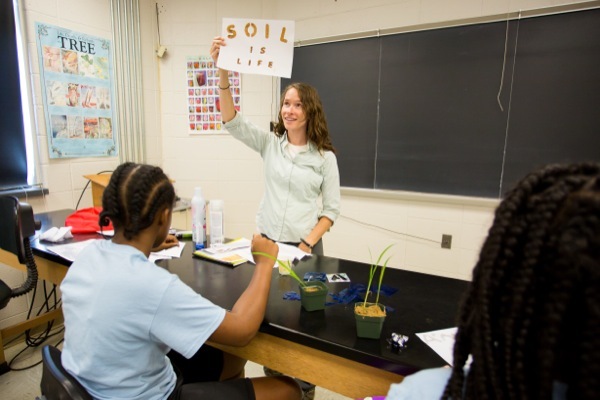 The inaugural Soil Is Life summer camp was held July 10 as 45 students from Serviam Girls Academy spent time on the University of Delaware’s College of Agriculture and Natural Resources campus learning from Angelia Seyfferth about the importance of soils. The camp was funded by a five-year National Science Foundation (NSF) Faculty Early Career Development Award that Seyfferth received in 2014. Because the United Nations has designated 2015 the International Year of Soils, Seyfferth, assistant professor in the Department of Plant and Soil Sciences (PLSC), said that it was a perfect time to launch the inaugural camp. The campers were able to get hands-on experience with soils and plants as they toured the 12 rice paddies that were recently installed on UD’s Newark Farm as part of the Rice Investigation, Communication and Education (RICE) Facility. They also toured a cornfield, investigated a soil pit and toured the organic vegetable farm created earlier in the year by Mike Popovich, a research associate in PLSC, and CANR Dean Mark Rieger. The students got to see vegetables growing in the garden and to learn about compost. “For many of the students, because they are from the inner city of Wilmington, they’ve had very little experience even walking off the sidewalk let alone walking onto a farm,” said Seyfferth. “So for many of them, it was very new and different than what they’re used to.” Rachael Romond, enrichment program director, graduate support director and summer program director at Serviam, said that getting the students away from their typical environment and out of their comfort zone was one of the most beneficial aspects of the camp. “I think taking them out of their environment really was beneficial,” said Romond. “Bugs were everywhere and they were kind of freaking out, screaming about bugs and the dirt and the soil, but at the end of the day, they loved it. You could see the joy on their faces.” Because of the size of the group, Seyfferth had help from members of her lab group as well as Nicole Donofrio, associate professor in PLSC, who gave the students an introduction to plant pathology and had a plant disease game with prizes for the students who participated. “Because there was such a large group, doing it by myself would have been impossible,” Seyfferth said, adding, “Nicole was a great help, as were the members of my lab group, as almost everybody participated in some aspect of the camp.” During lunch, the students took part in a trivia game in which Seyfferth asked questions about what they talked about earlier in the field and those with correct answers were awarded prizes. The students also were able to complete an activity in which they painted using soil. “One of the things I tried to relate to them is that, in addition to plants using soil for food, we also get pigments from soil minerals. The BareMinerals makeup has iron oxides, titanium dioxides, mica — all components of soil that are used to create this mineral makeup. We even used some of the mineral makeup to make soil paint,” said Seyfferth. The students also planted rice seedlings in pots and were able to take them home with them at the end of the day. Early soil exposure Seyfferth said the Soil Is Life camp is geared toward middle school students because exposing them to the importance of soils at an early age is of the utmost importance. “When we see UD students coming in as freshman, they’ve had very little exposure to soils and what they are and what they mean for our future,” said Seyfferth. “I think that introducing them at a young age teaches them to appreciate soil, to understand that there is a science around soil and that it is a resource that’s very precious.” Seyfferth added, “It takes a long time for a soil to develop but it takes a relatively shorter amount of time to degrade, and we can’t just make more soil. Teaching them to preserve it and to appreciate it is important and hopefully we can inspire them to consider going into environmental sciences or soil sciences as a career choice.” Romond said that providing young females from underrepresented populations exposure to science and scientific careers is an important part of Serviam’s mission. “We do a lot of STEM (science, technology, engineering and mathematics) work at Serviam. We really try to expose the students to different career paths that they might be interested in,” Romond said. “There’s an extreme lack of minority females in the science field, and we are primarily an African-American and Hispanic population, so it’s really important that we expose them to things that they never knew they had access to before, things that they never even knew existed. Some of them might not even have known what environmental science was, or what a rice paddy was, or what a soil pit was.” Soil, not dirt One big takeaway Seyfferth wanted the students to get from the camp is that soil is not dirt. “Once the soil is removed from its environment, it’s no longer a functioning soil. It can’t support plant life, it’s no longer soil. That’s dirt, and soil is very different than dirt,” she said. “Soil is something that is the Earth’s natural sponge. It’s important for cleaning water, for providing nutrients for plant growth, and for providing an ecosystem in which things like gophers and earthworms and other soil organisms can survive.” The message resonated with one student in particular who, when asked in a post-camp survey if they had learned anything new, answered, “Yes – that soil is not dirt. Because I always thought it was.” The camp ended with a trip to the UDairy Creamery where the campers were treated to ice cream courtesy of Rieger. “At the end of the day, they got to enjoy the ice cream and understand the connection between the soil that provides the grass for the cows to eat to make the milk that makes the ice cream they can enjoy,” said Seyfferth. Article by Adam Thomas Photos by Lindsay Yeager and Rachael Romond This article can also be viewed on UDaily.